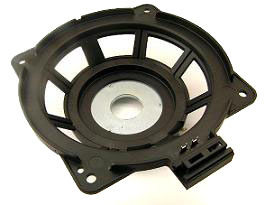 Insert Molding replaces metal and plastic assemblies, and components made solely of plastic or metal. This unique manufacturing process combines metal and plastic, ceramics, or multiple combinations of materials, components and plastic into a single unit. The process uses engineering plastics for improved wear resistance, tensile strength and weight reduction and uses metallic materials for strength and conductivity. The result is a single heterogeneous composite that always provides superior functional performance to any other manufacturing alternative for products requiring high current applications. This is the basic form of insert injection molding where a single shot of plastic encapsulates the insert and forms the molded product. 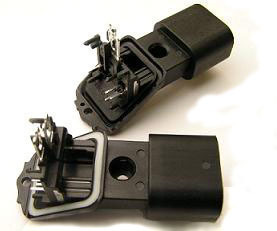 This method is often used when the combination of inserts and final molded component design may be too complicated for the single shot process. First, the pre-mold is insert molded. Then a second tool is used to incorporate this pre-mold as an insert to be over-molded to form the final molded part. Occasionally, the pre-mold is designed to incorporate additional post assembled inserts as a secondary operation prior to being over-molded. This component is then over-molded in a second tool to form the final molded part. Two shot molding is used to mold together two different colors or two different materials. Common usage is in decorating esthetic plastic parts such as Personal Computer keyboard keycaps or automotive indicator knobs that require backlighting as shown. Another use is to mold together two dissimilar materials such as nylon and thermoplastic elastomer. Here the nylon may be required for functionality of a part and the elastomer could be used for feel and esthetic purposes. Processing of two shot is usually performed by using co-injection or the pre-mold/over-mold concept discussed earlier. Co-injection is available in both horizontal and vertical presses. Electrical circuits are designed in plated metal so that they may be joined during the stamping process using tie bars or lead frames. 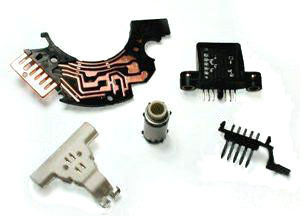 These connections are then blanked, severed and opened, or perfed, during the molding process to define the individual circuits in the mold tool prior to encapsulation. The advantage of this method is that it eliminates a post molding blanking die operation to separate the circuits. But, similar to post blanking, it has the disadvantage of leaving a water leakage path through the air-gap created by the perfing or "in-mold" blanking operation. Shows perfing that separates the stampings. This technique employs a very sophisticated tooling mechanism. It is used when the total over-molded area of multiple electrical circuits need to be sealed from the elements and the cost of utilizing the previously described pre-mold over-mold concept is too prohibitive. 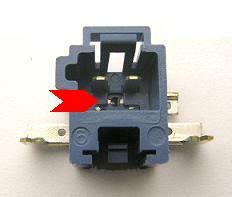 The basis behind this design offers "In mold" perfing of the stamping to define each circuit as previously described. The over-molding process which utilizes a sophisticated mechanism incorporating timed core pulls offers total encapsulation of the stamping(s) without any identifying signs that perfing has taken place. The main advantage of this method is the resultant lower piece part cost compared with a part that has to be pre-molded, blanked and then over-molded. The disadvantage of this method is the higher cost and longer lead-time it takes to design and build the tooling and the core pulling mechanism together with the extra cost of a specialized molding press. This method is therefore better suited for high volume applications where the cost of tooling can be amortized effectively. This technology uses a two shot process. However, the pre-molded part utilizes Metal Injection Molding (MIM) technology and can be of any 3 D form. The advantage here is that any circuit thickness can be offered so there is no current capacity limitations. There is usually no need for plating as certain metals can be chosen which, after specialized treatment, can meet customer functional requirements. Circuits can also be combined with terminals to make a complete interconnect system without the necessity of a separate connection. This technology also lends itself to a combination of metal and plastic where the original was a close tolerance machined metal product. 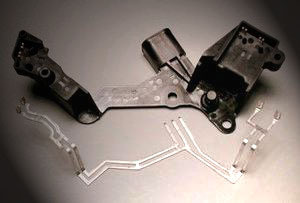 This method uses a two shot injection molding technique, similar to that used in insert injection molding, to form circuit patterns on complex, irregularly shaped plastic molded parts. The first shot is usually a non-plateable resin where the areas for the plateable resin are defined in the part. The first shot is over-molded with plateable resin. The exposed plateable resin defines the circuit traces. Following a chemical process that enhances the resin's ability to accept plating, the part is then plated with the desired materials and to the required thickness. This technology is better suited for low current applications.